Platte River at Mahoney State Park, Nebraska; photo by Babymestizo on Wikipedia (use permitted with attribution / share alike: CC 3.0). Nebraska designated the Platte River as the official state river in 1998. 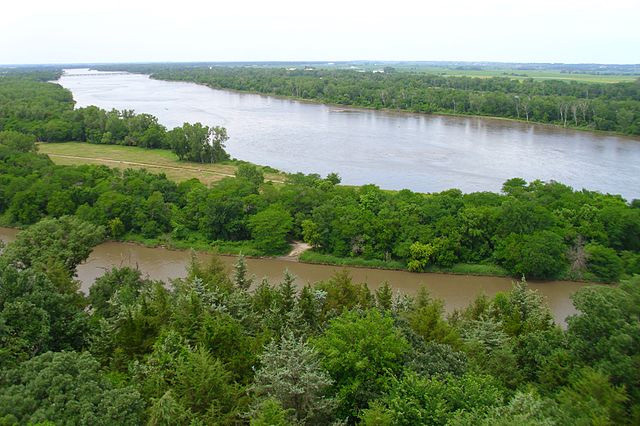 The name "Nebraska" is based on an Otos Indian word meaning "flat water" (referring to the Platte river). The Platte river was very significant in the westward expansion of the United States, providing the route for several major westward trails including the Oregon Trail, California Trail, Mormon Trail, Pony Express, the Union Pacific transcontinental railroad, the first trascontinental paved highway (U.S. Highway 30) and Interstate 80. The Platte river begins at the junction of the North Platte and South Platte rivers (near the city of North Platte, Nebraska) and flows east 310 miles (500 kilometers) through central Nebraska into the Missouri river, which in turn flows into the Mississippi river. Too shallow for navigation, the Platte is an important source of water for farm irrigation, recreation, municipal and industrial uses (such as hydroelectric power), and the river provides habitat for sandhill cranes and other migratory birds, fish, and wildlife. The Platte river is one of the most significant river systems in the watershed of the Missouri, draining a large portion of the central Great Plains in Nebraska and the eastern Rocky Mountains of Colorado and Wyoming. Indiana also designates a state river (the Wabash).